The three-year graphs below for the Redmond home sales 98053 Zip Code keeps you informed about the Redmond market trend. Come back monthly for all the current Seattle area market trends. 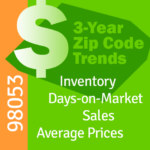 For home sales trends in Redmond ZIP Code 98052 click here. If you need more detailed information on Redmond home sales, such as home prices in your neighborhood, don’t hesitate to contact me.